Design guidelines used by flood plain managers, water resource engineers and planners consider both the depth and velocity of water to assess a person's stability in the water. These criteria are used to establish flood risk maps that may preclude development or, if not possible, require special design considerations to reduce risk to occupants (e.g., flood proofing). Velocities and depths in the shallow flood "fringe", as it's called in Ontario two-zone floodplains, may support conditional development. In other cases a Special Policy Area may be designated to support modest redevelopment in in the floodplain, but only in exceptional cases. 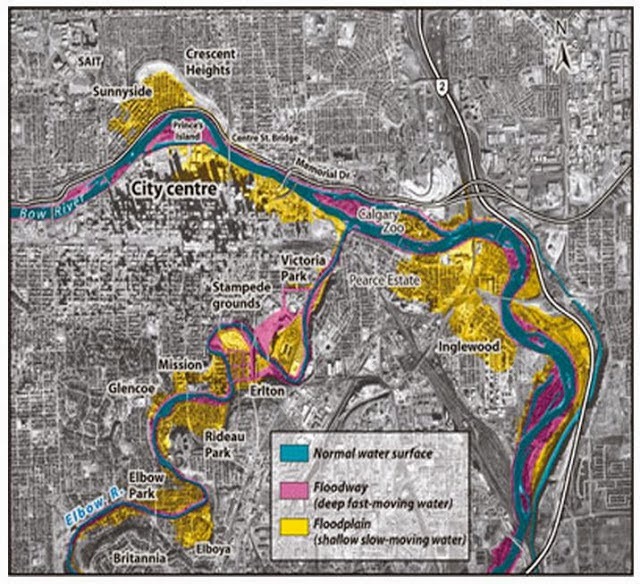 The Calgary Bow River flood risk map shows the risk areas on a plan view for the 100 year flood (an event that has a 1% chance of occurring in any year). The yellow areas of shallow slow-moving water are similar to the flood 'fringe' in terms of reduced risk. Certainly buildings and property are still at risk of flood related damage in fringe areas. Some provincial guidelines are presented below. “3 x 3 rule” - developed in the U.S. based on 3 ft depth and 3 ft/s velocity values. The rule suggests that people would be at risk if the product (multiple) of the velocity and the depth exceeded 0.8 sq.m/s (9 sq.ft./s). So slow moving water at 0.1 m/s and 0.8 m deep has a product of 0.8 sq.m/s and would the just stable for an adult, and so would 0.2 m/s and 0.4 m deep. 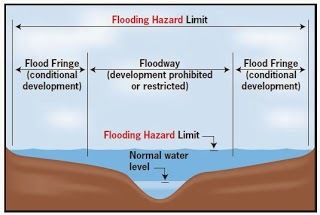 Hazard to life is linked to the frequency of flooding, and to depth of flood waters and the velocity of flow in the floodplain. 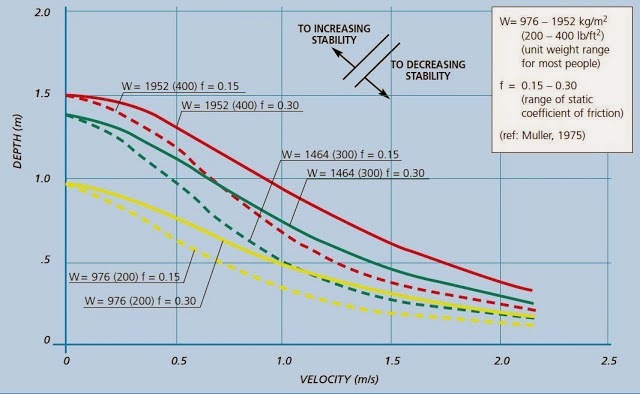 Depth increases buoyancy and velocity increases instability, so that each of depth and velocity should be studied independently or as a combined function. Any person in the midst of a flooded area will be acted upon by a buoyant force equal to the weight of water displaced by that person. The volume of displaced water and this force increases with depth until neutral equilibrium is reached and the person begins to float. Average adults and teenage children remain stable when standing in flood depths up to about 1.37 m (4.5 ft.). The average school child 6 - 10 years old would float at about 1.1 m (3.5 ft.), although smaller, younger children in this range would float at a depth of about 0.98 m (3.2 ft.). • a depth of about 1.37 m (4.5 ft.) is the threshold of stabilityfor teenage children and most adults. Moving water in the floodplain exerts a lateral force resulting from momentum thrust of the flood flow. This force acts to displace objects in a downstream direction. The shear force of friction of a person on the wet surface of the floodplain resists this force. However, even relatively low velocities of flow in the floodplain can pose possible flood hazards. The force exerted by various flow velocities can be developed for different age and size groups, but because its effect is tied to depth, a better appreciation of velocity effects can be gained by looking at both depth and velocity in combination. As a guide for personnel involved in stream flow/depth monitoring, the simple “3 x 3 rule” was developed in the U.S. based on 3 ft depth and 3 ft/s velocity values. The rule suggests that people would be at risk if the product (multiple) of the velocity and the depth exceeded 0.8 m2/s (9 ft.2/s). The Water Survey of Canada has the same rule of thumb and its Hydrometric Field Manual (1981) states, “a general rule of thumb which has been used in the past is arrived at through the product of the depth and velocity. Generally speaking, if the bed is firm and provides good footing, the product of these two factors should be slightly less than 1 m2/s, or roughly 9 ft.2/s”. It should be noted that this rule of thumb applies to trained professionals whose regular work accustoms them to the dynamic forces of river flows, buoyant forces from partial submergence and recognition of potential hazards, e.g. rocks, depressions, etc. They also enter the stream with equipment which will assist them in maintaining stability, e.g. tag line, wading rod, strap-on cleats for greater stability. experience as water survey staff in dealing with high depths, current speeds, unsteady footing, or cold weather/water conditions. more representative of a safe upper limit for most flood plain occupants. • the shear force of friction acting through the weight of the person standing on a wet surface in the floodplain. Figure 6-1 provides a graphical representation of depth and velocity hazards in the flood plain to show the limits of stability. Unit weights of 976, 1464 and 1952 kg/m2 (200,300 and 400 lb/ft.2) are used. Adults of average size would fall into the range between 976 -1952 kg/m2 (200 - 400 lb/ft.2) but young children would more appropriately fall into a range of 732 - 1464 kg/m2 (150 - 300 lb/ft.2). Only 7% of Ontario’s population is within the 6 - 10 year age range, i.e. young children (Statistics Canada, 1981).